“Espace Musées” is situated in Hall M, Terminal 2E at the international airport Paris- CDG. 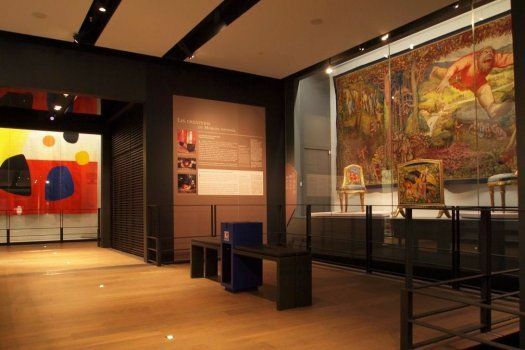 The financial endowment fund “Espace Musées” aims to promote French cultural and artistic heritage in all its forms through temporary exhibitions at Charles de Gaulle airport. “Espace Musées” organizes two new temporary exhibitions each year free of charge. We can mention Rodin, les Ailes de la Gloire (2012-2013), Dubuffet, L'Hourloupe, de la peinture au monument (2013-2014) or La création au Mobilier national de Louis XIV à nos jours (2014), 1900 La Belle Epoque (2015-2016) or the still running exhibition about Student's views on the city of lights (until 30th December 2018). In order to be able to visit “espace Musées” it is essential to be in possession of a boarding pass and to be flying from Hall M at Terminal 2E. If you are taking a plane from Paris-GDG airport with an alliance company sky Team Air to the United States or Asia, it is possible that you embark from gates M at terminal E. Once inside hall M of this terminal, Espace Musées is open from the first to the last flight and entrance is free. For more information, visit the official website of the Espace Musées. Refer to our accommodation section to find a hotel close to Roissy CDG or to read more about Roissy airport terminal 2.